This mojo marinated grilled chicken is so flavorful that it will become your favorite chicken recipe. A whole chicken is butterflied and marinated in a homemade mojo for 24 hours. 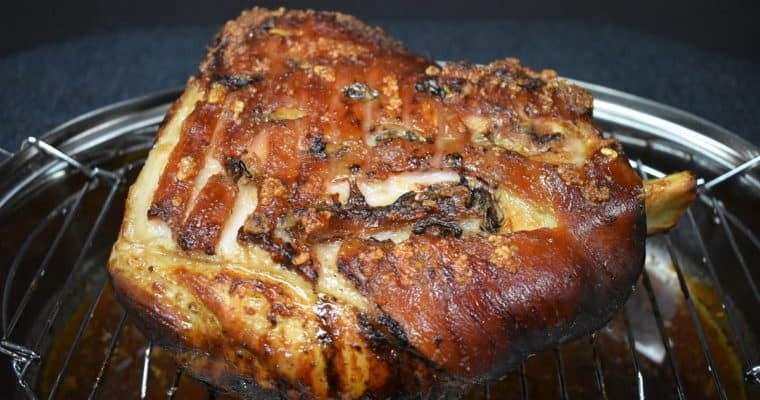 Then it’s grilled, low and slow until juicy, tender and delicious. This traditional mojo recipe is really easy to make, and don’t worry if you can’t find sour oranges, we include the perfect substitute. Love mojo? 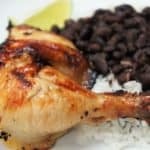 Try this Cuban roast pork recipe, this vaca frita de pollo, or these mojo marinated Cornish hens. Enjoy! If you’re making the sour orange juice: combine 1 cup of orange juice (preferably fresh squeezed) and ½ cup lime juice. Stir the juice to combine well. Peel the garlic. Smash the garlic cloves; place them on a cutting board and give them a good whack with the side of a large knife. Add the garlic and about ½ tsp. kosher salt to a mortar and pestle. Work the garlic until you break it down into small flat pieces. Add the smashed garlic, sour orange juice, olive oil, oregano, cumin, 1 tsp. salt, and the bay leaf to a medium bowl or jar (with a tight fitting lid). Stir or shake to combine well. Let the marinade sit in the refrigerator for at least 30 minutes, a couple of hours is better. Shake or stir well before using. Place the chicken in a large, re-sealable plastic bag, pour the mojo marinade in the bag and seal tightly. 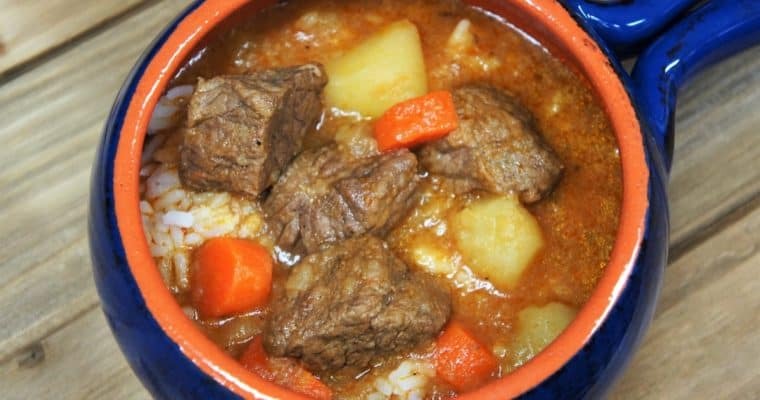 Place the bag on a pan or plate just in case it leaks, and refrigerate for 24 hours. Turn the bag a few times so that both sides of the chicken sit in the marinade. It’s important to note that all grills are different. The following instructions are just guidelines, based on how we grilled the chicken. You know your grill, so adjust the grill temperature and cooking time accordingly; we used a gas grill. Tip: Use a non-stick spray (one that’s made for grilling, it’ll smoke less) to reduce sticking. You don’t want to lose any of that delicious chicken skin. When you’re ready to grill, remove the chicken from the bag. Discard the leftover marinade. Preheat the grill. Grill the chicken on moderate-low to low heat, skin side up for about 45-50 minutes, until the chicken is almost done. Sprinkle the top of the chicken with salt and carefully turn it so the skin side is down. Add another pinch or two of salt to the underside. Grill the chicken for another 15 minutes or so until the internal temperature for the white meat and dark meat is at least 165°F at its thickest parts and the juices run clear when pierced with a knife. Remove the chicken from the grill and set on a plate or pan wait 10-15 minutes before carving to allow the juices to redistribute. 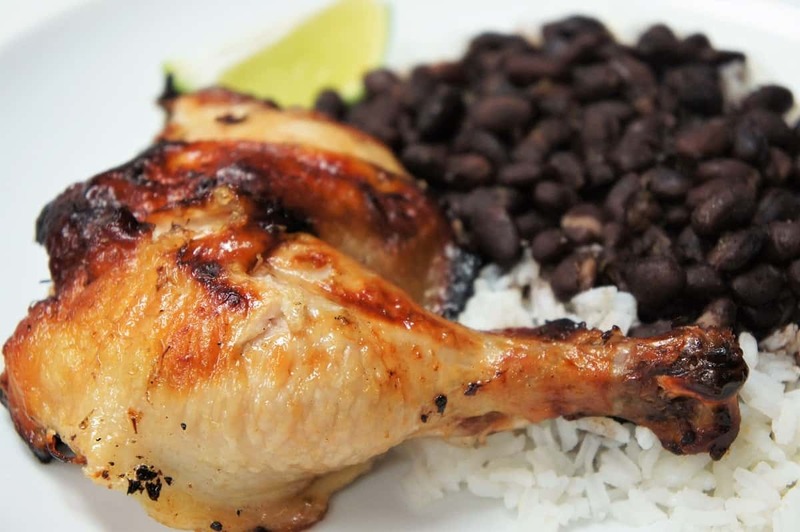 Serve the grilled chicken with rice and black beans for a delicious and satisfying meal. Enjoy! Take some help from your market butcher and have them butterfly the chicken remove the backbone for you. Don’t toss that chicken backbone, wrap it tightly in plastic wrap and freeze it. Next time you’re making soup, toss it in with the rest of your ingredients. Our chicken was so fall-off-the-bone tender that the legs just came off the chicken without cutting. 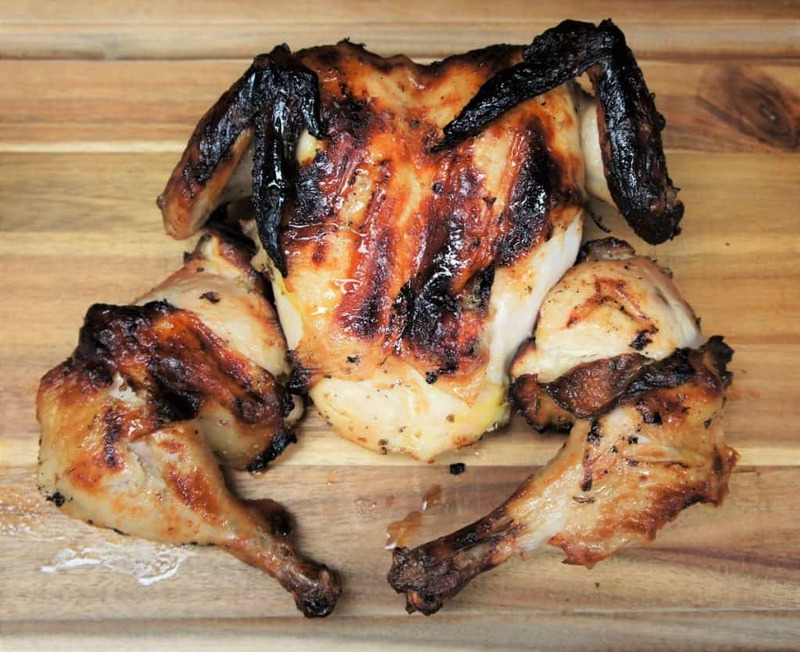 Turn the chicken carefully, but if the legs come off, that’s a good thing…a really good thing! This whole chicken is butterflied and marinated in a homemade mojo for 24 hours, then grilled until golden, juicy and delicious! If you’re making the sour orange juice: combine 1 cup of orange juice and ½ cup lime juice. Stir the juice to combine well. Add the smashed garlic, sour orange juice, olive oil, oregano, cumin, 1 tsp. salt, and the bay leaf to a medium bowl or jar (with a tight fitting lid). Stir or shake to combine well. Let the marinade sit in the refrigerator for at least 30 minutes, a couple of hours is better. Shake or stir well before using. Preheat the grill. Grill the chicken on moderate-low to low heat, skin side up for about 45-50 minutes, until the chicken is almost done. Sprinkle the top of the chicken with salt and carefully turn it so the skin side is down. Add another pinch or two of salt to the underside. Grill the chicken for another 15 minutes or so until the internal temperature for the white meat and dark meat is at least 165°F at its thickest parts and the juices run clear when pierced with a knife. Use a non-stick spray (one that’s made for grilling, it’ll smoke less) to reduce sticking. You don’t want to lose any of that delicious chicken skin.